Child marriage, defined as a marriage or union in which either or both parties are below the age of 18, today remains a threat to adolescent girls globally. Around the world, an estimated 41,000 girls fall victim to the practice every day, resulting in a range of negative outcomes that follow women throughout their lives and even affect future generations. In Uganda more than one third of girls still marry as children, and in some regions more than half of girls end their childhoods through marriage. 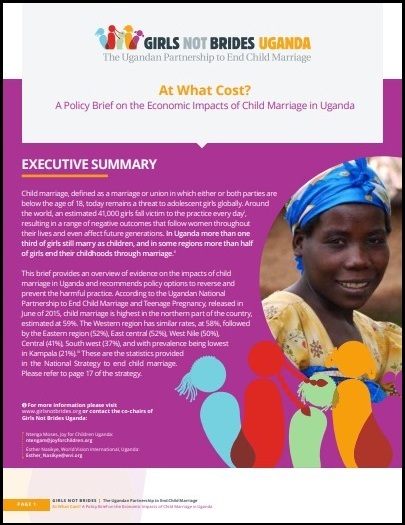 This brief provides an overview of evidence on the impacts of child marriage in Uganda and recommends policy options to reverse and prevent the harmful practice. To see more of ICRW’s work on the Economic Impacts of Child Marriage, visit our publications page here.